Heartland virus (HRTV) is a recently discovered virus that is believed to be spread by the bite of infected ticks. The virus can cause fever, headache, muscle aches, tiredness, diarrhea, loss of appetite and nausea. These symptoms can also be seen with tick-transmitted bacterial infections such as Rocky Mountain fever and ehrlichiosis. Cases of Heartland illness have been reported in persons in Missouri, Oklahoma, and Tennessee. Recently released animal data suggests the virus may be present across the central and eastern U.S., including Florida. 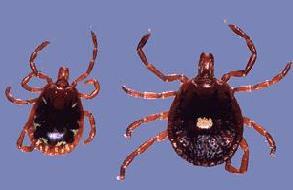 The lone star tick (Amblyomma americanum) is suspected to be involved with spread of the virus. Although there are no specific treatments for Heartland virus, the lone star tick can also carry bacteria such as Ehrlichia which can be treated with antibiotics, and there have been cases where a person was infected with both. Therefore, your health care provider will typically recommend antibiotic treatment if Heartland virus is being considered as a cause of illness.